Last month, Friday, June 19, 2015, was the 50th anniversary of South Vietnam’s National Armed Forces Day (“Ngày Quân Lực Việt Nam Cộng Hòa” in Vietnamese), a day to commemorate and thank the brave soldiers of the Army of the Republic of Vietnam for their sacrifices in defense of the former nation’s freedom. The day was celebrated annually in South Vietnam, and after the nation’s fall on April 30, 1975, it would be carried over and celebrated by Vietnamese refugees overseas. Although I did not get a chance to write about that day at the time it took place, I still want to share with you all my own small way of honoring the sacrifice of South Vietnam’s brave soldiers. I made the above picture myself, sort of, using my ultra basic computer animation/Photoshop skills. Before explaining the details of this self-explanatory picture, I must first give credit to the 720mpreunion.org website from which I acquired the image for the flag of the Army of the Republic of Vietnam, the centerpiece of this art/wallpaper. I did not draw that flag myself, but merely included it as part of my design. So, with credit given where credit is due, let’s talk about the picture. As explained above, the emblem in the picture is the flag of the Army of the Republic of Vietnam. It is headed by an eagle, clasping two swords in each claw, surrounded by two laurel wreaths, and carrying the Coat of Arms of South Vietnam on its chest. Behind the eagle are the three horizontal red stripes of South Vietnam’s national flag, which represents the three regions of Vietnam: The North, the Central, and the South. This takes us to the part of the wallpaper/art that I actually worked on myself. The yellow background, and the prominent, in-your-face, black-colored writing in English that reads, “Fatherland. Honor. Duty.” That was all me, people. Pretty crazy, right? I know the design is simple, but I think it conveys the message strongly. 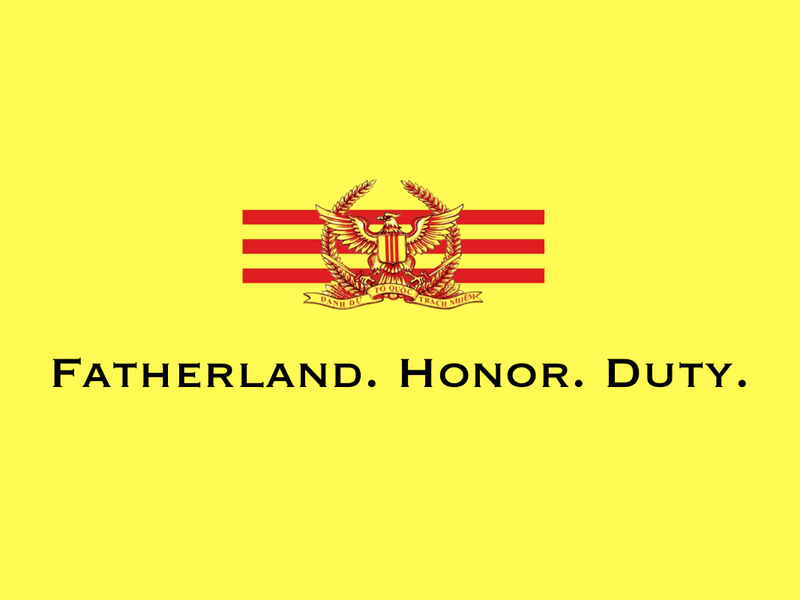 South Vietnam and its armed forces had a proud and noble motto. They fought by it, and they died by it. The Republic of Vietnam was a democratic nation that championed the rights and freedoms of its citizens. The ARVN defended their country with courage, pride, and dignity. It is because of these reasons that even after 40 years since the nation’s fall, we still honor this nation and its brave soldiers. We are proud of our South Vienamese legacy, and we will remember the courage and sacrifice that its soldiers made in defense of our freedom. To the soldiers of the ARVN, from all freedom-loving Vietnamese people everywhere, we thank you. I felt I should follow up from my last article about VCP General Secretary Nguyen Phu Trong’s self-proclaimed “historic” visit to meet President Barack Obama in Washington. Like I forecasted just a day ago, the talks indeed yielded zero actual change from the status quo. The talks were straightforward, relaxed, with little point whatsoever. 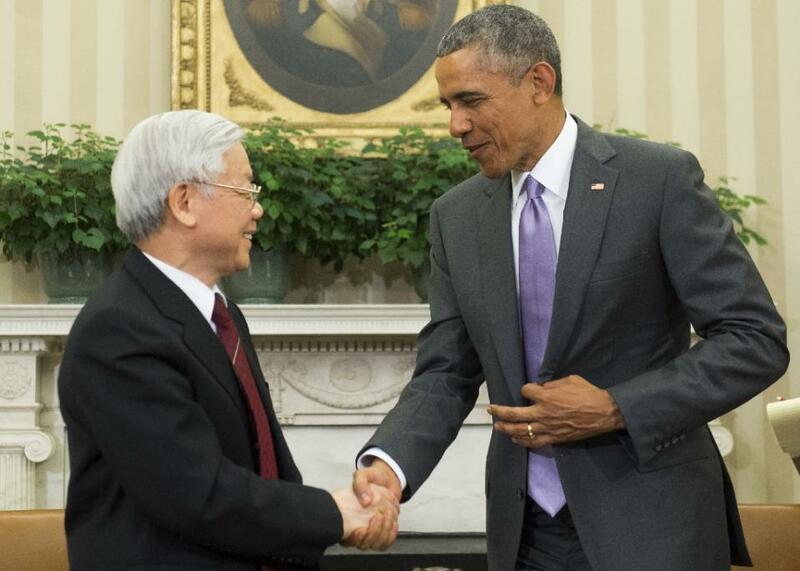 Pleasantries were exchanged, Nguyen Phu Trong lauds the “progress” that has been made in U.S.-Vietnam relations, with President Obama courteously expressing optimism for the future. The usual topics were brought up, like Chinese aggression in the Pacific, the possibility of the formation of the Trans-Pacific Partnership, and of course, the issue of human rights. There were some notable happenings that revolved around the meeting, but were not part of the meeting itself. A group of bipartisan lawmakers in the White House advised the President prior to the meeting to press Nguyen Phu Trong more strongly on the human rights issue. The other notable happening in relation with Nguyen Phu Trong’s visit was the hundreds-strong protest taking place outside of the White House during the meeting. 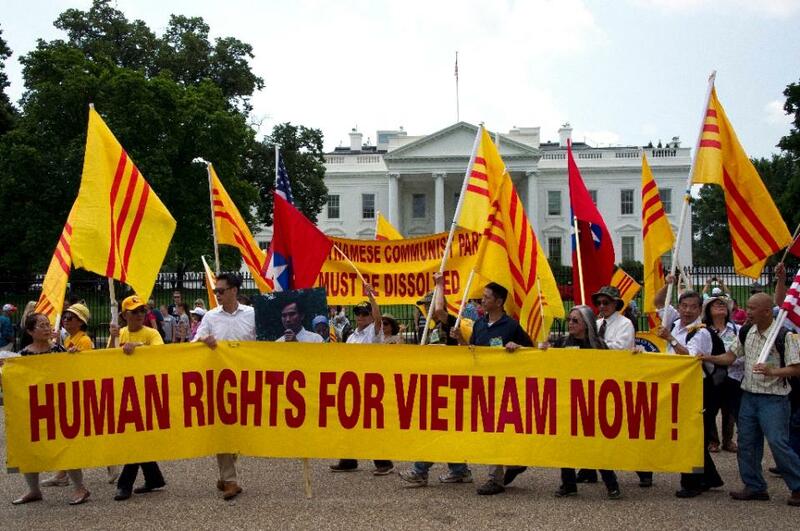 A few hundred protesters rallied outside the White House, calling for expanded human rights in Vietnam — an issue that has sparked concern among some American lawmakers about deepening ties. Demonstrators carried signs with slogans like “Freedom of speech in Vietnam now” and called on Hanoi to release all political prisoners. Although the meeting between President Obama and the idiot General Secretary Nguyen Phu Trong was exactly as unproductive and pointless as expected, I am still happy to hear that the issue of human rights is still on the minds of U.S. lawmakers. I am even more proud of the part played by the Vietnamese community. Commendation to all who participated in the protests yesterday. You made a great impact, and your passion and dedication is undoubtedly being heard. As the actions of the U.S. lawmakers urging the President to be tougher on Trong has shown, your voice is making a difference. We have to keep pushing, we have to keep making a difference. Persistence is everything. Vietnam’s General Secretary, the leader of the VCP and the country’s man in charge, Nguyen Phu Trong arrives in Washington today to meet with President Barack Obama. 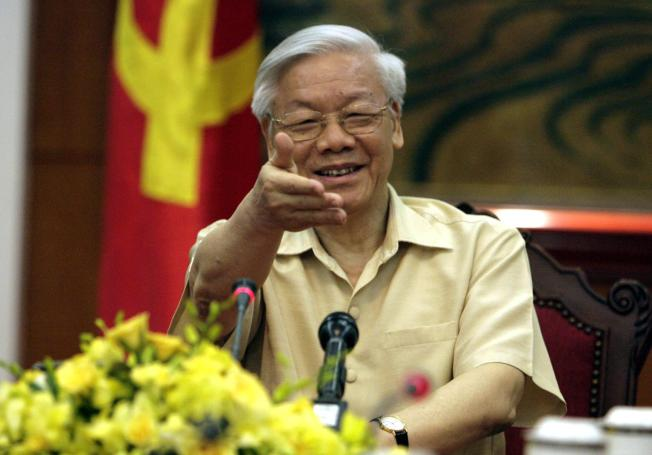 On July 7, 2015, President Obama will welcome to the White House Nguyen Phu Trong, the General Secretary of the Central Committee of the Communist Party of Vietnam. The President looks forward to discussing with General Secretary Trong ways to strengthen further the U.S.-Vietnam Comprehensive Partnership, reflecting on the accomplishments of the past twenty years since the normalization of bilateral diplomatic relations. The President also welcomes the opportunity to discuss other issues, including the Trans-Pacific Partnership, human rights, and bilateral defense cooperation. I’m not exactly sure what will come out of this meeting. The Vietnamese government in Hanoi has demonstrated time and again that they are firmly under the thumb of Beijing. Moreover, members of the VCP, with party chief Trong being one of the biggest offenders, have all shown ineptitude in reaching any sort of solution to the woes of their country, economically, socially, and politically. For these reasons, I believe that President Obama’s hopes of establishing closer ties with Vietnam will once again fall short of any substantial gains. Human rights remains an issue that has hindered the U.S. goal of establishing a meaningful partnership with Vietnam, and judging from the ongoing violations that the communist state continues to orchestrate, this issue shows little hope of being resolved anytime soon. The U.S. has deep interests in strengthening relations with Vietnam, and is willing to offer the communist nation vast benefits to reach that end. However, judging from the VCP’s tendency to fashion their foreign policy in accordance with Beijing’s wishes, it is highly unlikely that Trong or the VCP will risk offending China by warming up to the United States, no matter how beneficial siding with America is to Vietnam’s growth. In terms of strengthening relations with Vietnam, the U.S. is willing to offer Vietnam a seat in the new Trans-Pacific Partnership (TPP), as well as the easing of restrictions on the sales of lethal weaponry, and the increasing of economic ties. The U.S. wants to provide Vietnam with these major benefits, and has been very patient with the communist state’s continued intransigence, most notably with Vietnam diplomatically siding with China and blatantly abusing human rights domestically. Besides the complicated situation with China, human rights is the only major impediment to Vietnam gaining the extensive economic, military, and geopolitical benefits that comes from partnership with the United States. However, as a communist government who is struggling to maintain stranglehold on power, as a cowardly government in constant fear of offending China, and as dullards who can’t hit water if they fell out of a boat, the Vietnamese Communist Party and its leader Nguyen Phu Trong will not be smart enough to take the many benefits that the U.S. is wanting to give to them. In my predictions, no substantial agreements will be met between Vietnam and the United States. Unless President Obama is willing to overlook the human rights issue completely, something I really hope he does not do, it is doubtful that the establishment of the Trans-Pacific Partnership will become a reality. Nguyen Phu Trong, nicknamed “Trọng Lú,” or “Trọng the Stupid,” or “Trọng the Confused,” or “Trọng the Dazed,” or “Trọng the Dullard,” (depending on your choice of translation) by the international Vietnamese community, will not make the obvious choice of simply improving human rights to vastly benefit his country. It’s so simple, but he will not get it. He’s called Trọng Lú for a reason. The only thing I hope to see today are the major democracy, human rights, and anti-communist protests upon Trong’s arrival. Any organization that is staging demonstrations, all the more power to you. Come out in droves, make him hear you.